Whether you mix in some freestyle as you cruise to campus or head to the hills to shred the headiest downward runs, when it comes to distance skating, there’s no doubt that longboards have their appeal. With that the case, we’ve done some of the hard work and put together a list of the best longboards you can buy. Old timers head straight through to the selection below, but for those dipping their toe in for the first time, it’s worth getting to know a few essentials first. Your Drop Through longboards, like the MAXOfit Deluxe Longboards Geolines Drop Down No.33, are best for your downhill carving as they have a low sense of gravity. 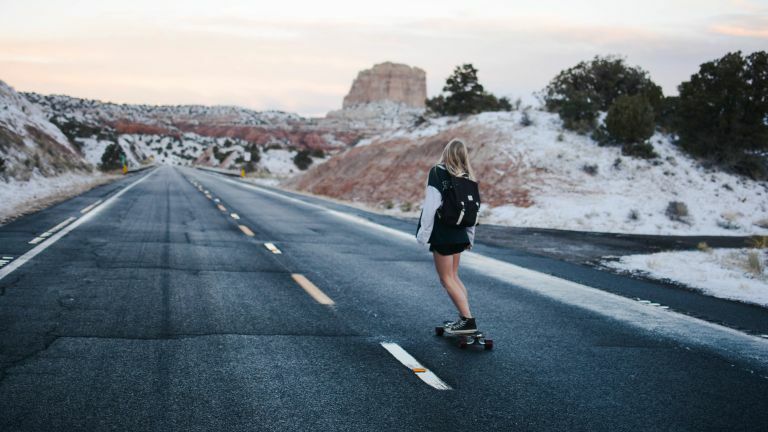 Penny Boards, though on the shorter side, are great for mucking around on, and top mounts, like the Quest Super Cruiser REMIX Longboard, while less stable than drop throughs, give you a touch more freedom when it comes pulling tricks as you cruise around. Strong, yet supple and great for carving, the MAXOfit ticks many boxes. Promising to deliver on speed, control and turning, this drop through board with its small wheel base and solid flex makes it your first choice when you head to the hills. There’s a range of awesome board and wheel combos to choose from, too, making it worthy of top place on our list. If carving is your game, Osprey is your name. This twin tip, almost symmetrical board has been designed with speed and durability in mind. Osprey promise that riders will be able to practice their carving and develop their technique, with the ABEC chrome bearings adding a greater level of stability. There’s also a range of cool designs and lengths to choose from, with the Diamond Blue offering a favourable 40.5 inches to the table. Ideal if you’re after a skateboard that you can cruise up to campus or muck around with around town, this all black board will have you creeping up on kerbs and street ramps like a ninja. It features a non slip waffle deck that’ll provide the grip you need to perform kicks and tricks, while the aluminium trucks are lightweight so you can build up decent speed on the straights, too. Offering up a 44 inch length, this board is ideal for getting from a to b with the option to freestyle if you want to. Thanks to its bamboo deck, it’s both flexible and durable, making it the perfect choice for cruising and carving. The deck design is pretty cool too, with plenty of people giving it five out of five stars for both functionality and appearance. Want a short longboard but not the plastic of a Penny? Your quest is complete. Whether you love free-styling through town or rolling down empty roads, this longboard from Quest is a fantastic all-rounder. The 36 inch deck gives you the option to mess around, with a kicktail and a kick nose to give it is some air time, while the light aluminium trucks and bamboo and maple deck combine forces to offer up some smooth cruising. If you’re looking to get back in the game, both the board and the price are on point. Thanks to its drop through design, the Atom 41” has a low centre of gravity, offering beginners stability as they gain speed, with the wheels designed for minimal biting when it comes to conquering those carving techniques. Lower to the ground, it’s also easier to push, which is great if you’re planning on riding it to work or college, and with users commending its solid build, it should put up with whatever abuse beginners throw at it.